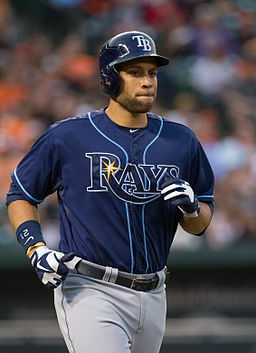 The Rays released James Loney a few days ago. That’s a big drop down for the 31-year-old first baseman, who was 6th in Rookie of the Year polling in 2007. Though his bat slowed down in 2015 and he posted his worst lines since 2012, he still hit .280/.322/.357. Since the Rays released him, they’re due to pay him $8 million this year, meaning he could pull a Gary Sheffield and play for the league minimum. He doesn’t hit like a traditional first baseman: his 2015 numbers extrapolate to about 25 doubles and 6 home runs for a 162-game, 603-plate-appearance season. He’s a lifetime .266/.310/.418 pinch hitter, and he’s made three appearances as a pinch runner, with the last one coming in 2012. Loney is known as a solid defensive first baseman, although his defensive wins above replacement have been reliably negative and spiked down to -0.9 in 2014 and -0.7 last year. There’s an argument to be made that Loney might be more useful in the National League, considering the somewhat greater number of ground balls in the NL compared to fly balls. Loney had solid lateral movement, but the AL averaged .82 ground balls for every fly ball, and the Rays were at .74, in 2015. Meanwhile, the NL averaged .89, and Mets pitchers were right on the button. Closer Jeurys Familia was up at 1.52, with Bartolo Colon the fly-ball-est starter at a .75 GB/FB ratio. Loney might be more comfortable making picks than fielding high throws. However, look at the marginal Mets player: Eric Campbell. With Wilmer Flores in a utility role and five full-time outfielders, picking up Loney would mean dropping Campbell or a pitcher. Conceivably we could talk trading Lucas Duda, but that’s not a move I can see the front office making (nor is it a move I’d endorse – Loney’s role would be as a lefty pinch hitter, double switch enabler, and defensive replacement). The Mets are carrying 12 pitchers, but that number includes the as-yet unproven Jim Henderson and starter-in-waiting Logan Verrett; one of them will have to go when Zack Wheeler comes back from Tommy John surgery. Temporarily dropping to 11 pitchers would set us up for a much nastier cut when Wheeler returns. The truth is that Campbell isn’t a long-term solution, but Loney is even less of one. Campbell is expected to serve as a sixth outfielder in emergencies, while Loney hasn’t played the outfield since the Bush administration. Campbell was also called on to run for Travis d’Arnaud in Tuesday’s game, and logically he’s the soundest choice – Alejandro De Aza swiped 7 but got caught 5 times last year, and the 205-pound Flores isn’t exactly tearing up the base paths. Juan Lagares has some speed, but he’ll be starting games against lefties and won’t always be available from the bench. Loney is also a one-position player, and – though Flores’ ability to play anywhere in the infield is valuable – Campbell is there to prevent serious problems like Anthony Recker playing third base. Campbell also squatted a minor league game last year, so while I wouldn’t trust him to catch, he’s willing to do it. I’d rather Campbell were playing every day – if he’s going to develop, he needs the time. But bringing in Loney and sending Campbell down would be a mistake for the Mets. It’s a shame. I like Loney. But I don’t think he’ll fit here.